The battle lines are set. And the clock is now ticking. In the next six weeks the fate of Kinder Morgan’s highly controversial Trans Mountain pipeline, will be sealed. On the one side are the Federal Government of Canada, the Government of Alberta, the oil industry and many in Canada’s business community. 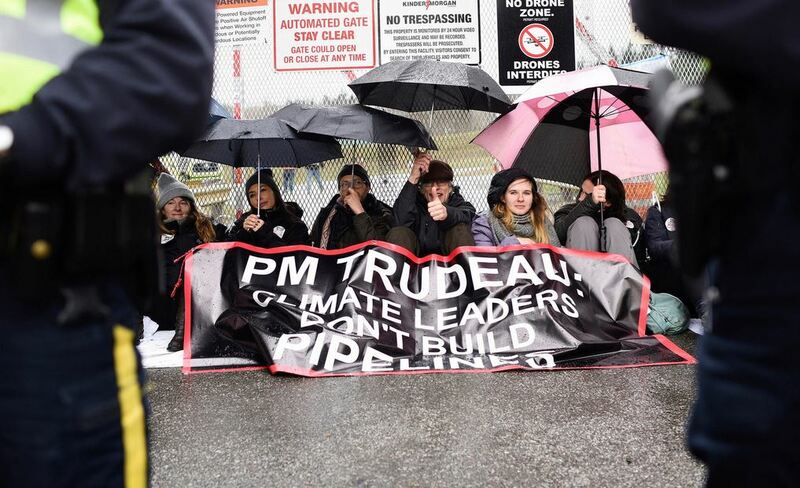 They support building the pipeline which will triple the amount of dirty tar sands that will flow from Alberta to the coast of British Columbia. On the other are the Government of British Columbia, and the local community, supported by a huge coalition of environmental and indigenous groups, who have been staging a series of mass protests, demonstrations and events against the pipeline. Hundreds of people have been arrested protesting against the pipeline in the last month. And now the opposition scents victory. 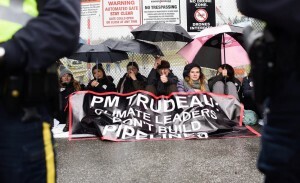 On Sunday, Kinder Morgan sent shock waves across Canada and the oil industry when it announced it was “suspending all non-essential activities and related spending on the Trans Mountain Expansion Project”, until at least May 31. Until that time, Kinder Morgan “will consult with various stakeholders in an effort to reach agreements”, said the company, in particular “the ability to construct through BC; and, adequate protection” of its shareholders. The company added: “While we have succeeded in all legal challenges to date, a company cannot litigate its way to an in-service pipeline amidst jurisdictional differences between governments”. The company said the British Columbian government needed to end its opposition before it would commit to completing the pipeline. Yesterday, Kinder Morgan’s chief executives reiterated the company’s plans to abandon the pipeline if it faces any further “roadblocks”, “sparking industry fears the $7.4-billion expansion is close to being shelved”, reported the Globe and Mail. This is not good for those looking to invest in the pipeline and dirty tar sands which have seen a huge amount of capital flight in recent years. “The Alberta-based industry had already fallen out of favour with global investors, including the world’s biggest energy companies. Now, one of the best hopes for rekindling some of that interest looks increasingly shaky,” Globe and Mail added. In response to Sunday’s announcement, shares of the company fell more than 12 per cent in Monday’s session on the Toronto Stock Exchange. But all is not lost for the company. The news quickly spurred a response from the Federal and Albertan Governments: Albertan Premier, Rachel Notley, said that her government was prepared to do “whatever” it takes to get the pipeline built, including investing in the pipeline. “This pipeline will be built,” she said.